Game 163 proved to be the final straw that broke the Yankees’ back. And not only was it frustrating to watch, it was a compilation of every Yankee game over the last month. The lack of offense. Not coming through in the clutch. Giving up cheap hits that cost them in the end. This is what seemed to have happened throughout the entire month of September. The game started with roaring cheers and ended with deafening boos. NBC Sports ran a piece today by Craig Calcaterra which summarized just how the atmosphere in the Stadium went from radiating positivity to the most negative place on the planet. Reading through that, I agree and disagree. Yes, the Yankees made it to the playoffs when no one expected them too, which is fabulous. Yes, they got booed relentlessly, especially as the game wore on. No, they didn’t deserve to be booed, but they did deserve to have their fans disappointed in them. Frustration was expressed on the faces of every player in the game yesterday, but I think the part that frustrated fans the most was it didn’t even seem like they wanted to be there. Yes, with the new Wild Card format, the Yankees had their Wild Card spot (which they won fair and square) taken from them by a younger and quicker team. But it was clear that they were exhausted and just had nothing left. Age has always been a defining characteristic in the Yankees’ lineup this season and this match-up between youth and aging proved to be won by the youth. The Yankees were run down after a long season, and while that doesn’t warrant the kind of boos they received, they still did not show up to play. Swinging at first pitches and hitting only singles…nothing of substance that could back up a decent performance by Tanaka. The bottom line is the Yankees took a great season and tumbled downhill, bringing the hopes of fans with them. They hit their stride at the wrong time and just collapsed when the final stretch came along. But look at the teams in the playoffs…all of them made big trades at the July trade deadline. Toronto for Price and Donaldson. Royals for Zobrist. Rangers for Hamels. Astros for CarGo. The Yankees chose to stick with young talent instead of making the move for a starting pitcher or a reliable hitter. While they preserved their talent, these other playoff teams showed that the moves they made at the deadline were important. In fact, these moves helped them become dominant in the days leading up to the playoffs. Can’t say that about New York right now…their lack of moves might have cost them a shot at a deep playoff run. However, it also probably wouldn’t have included their run with rookie sensations Severino and Bird…so we take what we can get. All in all, it was a great season for New York. The age finally caught up with them and lack of offensive support drove them straight out of the playoffs. So now we get to sit and watch other teams accomplish the goal we’ve worked all season to get. But that is okay, because the Yankees had a season far beyond anyone’s expectations. And for that, I can say I am proud to be a Yankees fan. 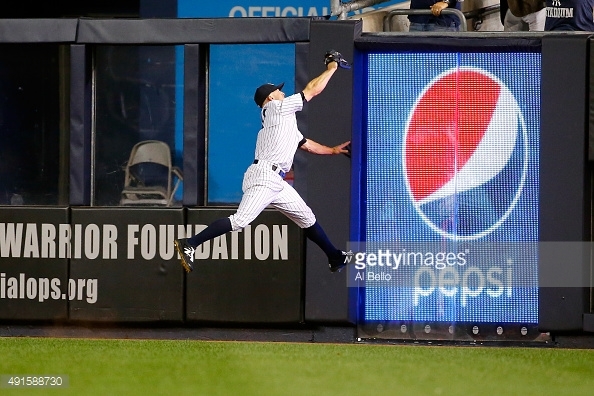 during the American League Wild Card Game at Yankee Stadium on October 6, 2015 in New York City. ← Game 163: Is it about baseball or something more?